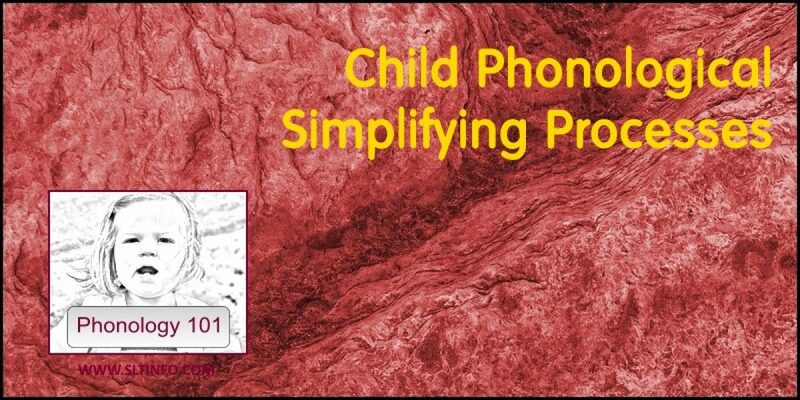 Phonological simplifying processes, as we will describe them in PHONOLOGY 101, are not generally a feature of adult language but they do occur in typically developing child speech. As we have seen, the processes constitute a set of rules or procedures for simplifying speech. Several have been identified, together with the age ranges at which children might typically use any particular simplifying process. However, the procedures should not be thought of as a hierarchy through which every child must pass: phonological development is not linear. Some children activate particular processes and others activate different processes. The reasons for this are not fully understood. However, we do know that there is a lot of variation in the way children pronounce words and that this can even change on a daily basis. Between 1;06-4;06 years, the typically developing child gradually eradicates any simplifying processes. It is important to remember, of course, that this is a passive process. The child is not willfully choosing to activate and eradicate particular processes. Rather, according to the theory of natural phonology originally proposed by Stampe (1969), speech patterns are governed by an innate set of phonological processes. Consequently, all children are equipped to respond to the difficulties of speech production through the use of simplifying processes. As they develop, they learn the phonological rules of the particular world language they are exposed to. Their speech motor system also develops and they learn to inhibit certain processes as they move closer to an adult, language-specific phonological system. So, as the child moves towards the end of their fifth year, their speech moves closer to the adult model. Of course, if any simplifying process persists beyond the age at which we would expect it to have been eradicated this may present as a phonological disorder. The severity of any disorder will be influenced by such things as the number of phonological processes that are still operating (just one or several), the type of process (e.g. backing), pervasiveness (e.g. only active in syllable-initial or syllable-final position, or both), and so on. Our main concern in PHONOLOGY 101, however, is not to describe or explain speech disorders in any depth. Nevertheless, the descriptions of some of the major simplifying processes operating in typical phonological development that follow will inform our understanding of speech difficulties. Stampe, D. (1969). The acquisition of phonetic representation. Papers from the fifth regional meeting (pp. 443-454). Chicago: Chicago Liinguistic Society.